‘getting out of the swimming pool move’. The mantel shelf: 1. Press Up. 2. Moving the foot up, the closer to the hands the better. 3.Turn the hand furthest from the foot round to a palm. 4. Roll your shoulder over your hand, and slowly stand up maintain balance as you go. There are four essential movements which make up a mantelshelf; press up, place your foot or heel over the edge, turn your opposite hand toward the foot that you moved up (rotating it palm down), followed by pushing down off your palm and stepping up your other foot to stand up. Use a low wall, this should be relatively easy as you can grasp the opposite side of the wall. Place your foot as close to your hand as you can and then as far away as possible, which makes the move easier? Then try a narrower wall, sturdy fence or gate. 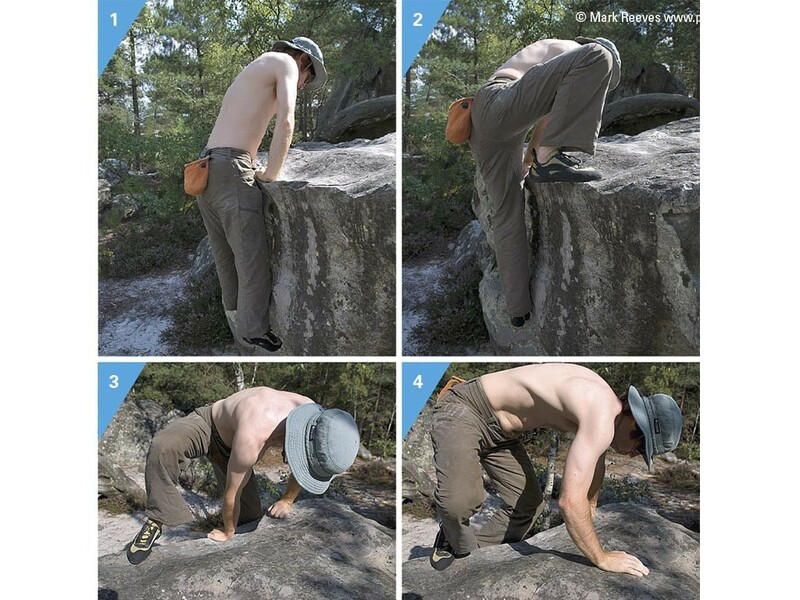 Then onto a small boulder, keeping both hands on the very edge (not reach- ing over to any holds). This may feel as if you might fall off backwards. Then nd a ledge on a vertical wall, a sturdy mantelpiece or (the most ex- treme) the horizontal bar of a soccer goal post. The wall will get in the way, feeling like it is pushing you out. It’s great party game too. With a large and stable table, reverse mantel one end, traverse underneath it and mantel back on top the other side. Place your foot on a good hold. Use your palm to push down. Get your shoulder and belly button over the foot.